I started writing this post some months ago. It sat half-finished in a notebook, the flow interrupted by the train journey, on which I was writing, coming to an end. I kept meaning to finish it, get it up on this blog, but it seemed like there would always be time. The news of the death of David Bowie came two days ago, on waking, announced on Radio 4. Sleepless during the night, I had put the radio on, then fallen back to sleep, waking again just before 7.00 a.m. Then the news. Mishearing it as David Byrne at first, then the true name was unmistakable. There is – was – only one David Bowie. Switching to 6 Music, in floods of tears, Shaun Keaveny and Matt Everitt sounded so shocked, knocked sideways, and then came a day of Bowie songs, the airwaves taken over by his music, stories of in-the-flesh encounters and, for most of us, the personal relationship we had with Bowie and his music, him talking to us in our bedrooms, alone or with friends. For a man who was so protective of his private self, who presented several public persona, we all knew him. He made us feel part of it: “Oh no love, you’re not alone,” he sang, shouted out, in ‘Rock and Roll Suicide’, and we felt that someone understood. Our all girls grammar school was decidedly liberal about some things. The compulsory wearing of hats was abolished in our second year (bottle green, round felt in winter; straw boaters in summer). We could wear any style of skirt we liked, as long as it was bottle green. And the decorating of form rooms was allowed by some teachers. In Class 2H, 1972-73, we had Mr Stokes as our form teacher. Tall, lugubrious, bearded, in a dark pin-striped three piece suit with a watch chain stretching between his waistcoat pockets, we thought we were in for a no-fun year. Mr Stokes turned out to be a sweetie. 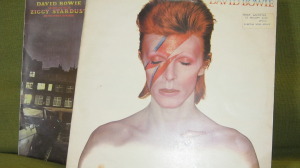 He won us over with chocolate treats at Christmas and Easter, and by allowing posters on the back wall of Room H. One of these was a double page of Bowie from a teen magazine. Some years away from being named the Thin White Duke, he was super-skinny, hair razor-cut and orange, pale-skinned, made-up, and wearing a kind of short knitted jumpsuit with leggings of the same orange and red stripes. ‘Snow-white tan,’ like Ziggy Stardust. He wasn’t looking out at us, as David Cassidy was, on the same wall, wholesome and pretty, or Michael Jackson, in the days before plastic surgery and skin bleach. He was facing right, half-crouched in performance. David Bowie was exotic, alien, strange, yet an ordinary boy from Bromley. We thought, in those days, that he wore a coloured contact lens to make one eye look different. I learned only this week that his unusually large pupil, diminished iris, was the result of a playground accident. But then there were, and remain, so many secrets, so much misinformation about this enigmatic singer, performer, composer, actor. What I can say is, in 1973, he was the most exciting thing on my horizon. If I could get away with watching Top of the Pops (my mum said it was ‘pure rubbish’), he might appear singing ‘Life on Mars’, strangely contorted and with bad dentistry, and absolutely mesmerising to my 13-year-old self. There was a cabinet at the top of one the staircases at school, which was given over to different classes to make displays, and our theme was Life on Mars. We hadn’t quite got the meaning of the song, so took the title literally, and created a planet surface populated by little rubber aliens that you could buy from sweet shops, with holes in the bottom to balance them on fingers or use as pencil tops. David Bowie’s songs and albums bring back such memories, such feelings. I remember the track listings of The Fall and Rise of Ziggy Stardust and the Spiders from Mars and Aladdin Sane, which I still own on vinyl. with stickers of my name and address on, for when I took them to parties. 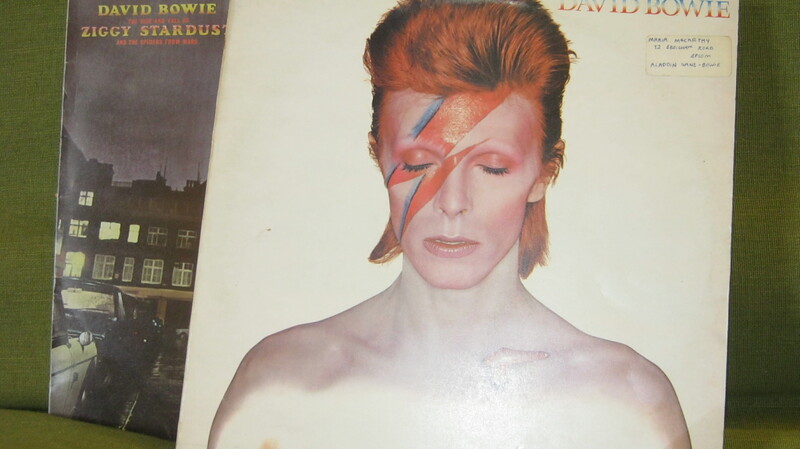 One person was not so careful, and I accidentally came home from a party with two copies of Ziggy Stardust, unable to reunite it with its owner. Diamond Dogs, borrowed from a friend, reminds me of the death of another friend. I had been listening to it constantly during her short illness and following her death, and can now no longer bear to hear it. I can’t see the cover, or hear the opening track, without being thrown back 40 years to that time, that grief. David Bowie, and other music of that era, is associated with seminal moments, suicidal thoughts, feelings of sorrow and embarrassment, first kisses, love, betrayal, and the Sunday boredom of ’70s teenagehood. There the notebook entry ended. Thank you, David Bowie, for making me feel like I was not alone. May you rest in peace.